It’s been a while since we’ve posted up one of the elegantly simple Guzzi singles, so when I came across this classic Falcone, I thought it was high time we went old school. 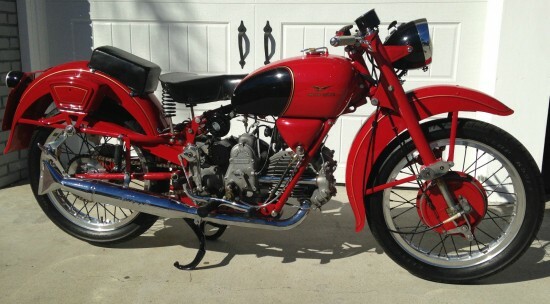 Or, well even older school… This 1957 Falcone is a pretty late version of their classic horizontal single that offered a winning combination of practicality, handling, and good looks. Gone are the earlier bikes’ exposed hairpin valves, which is a shame for the appearance, but likely a great idea for riders who plan to use their bikes: with that head so close to the ground and to the front wheel, you’ve got to figure grit and grime are a real pain for regular users. And make no mistake: these were definitely meant to be ridden. 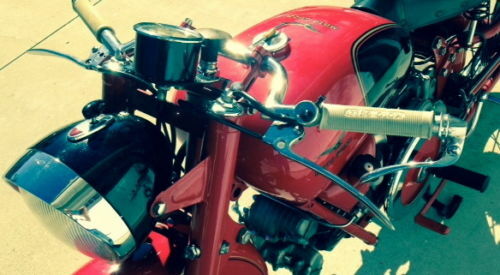 With a very low center of gravity, small frontal area, and a huge external flywheel that allowed the bike to lope along at tractor-like rpms, the Falcone was nimble, durable, flexible, and handled well. 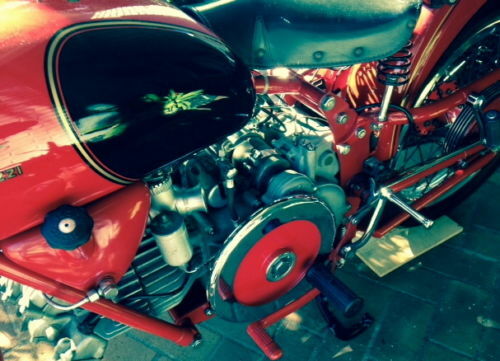 With a seemingly inadequate 23hp produced by the 500cc engine, it’s the bike’s locomotive torque that allowed the bike to lope on up to an 85mph top speed, a very respectable speed for a single-cylinder motorcycle! 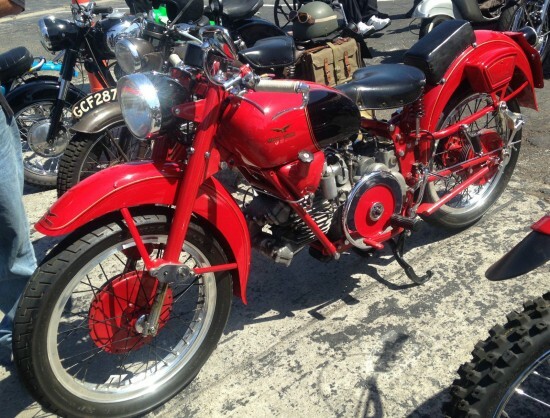 This example is in excellent condition cosmetically and is obviously a runner, my very favorite kind of bike. Show or ride, low miles . This bike starts easy, runs great, drives straight , stops well, looks great. Has won shows! Belonged to two very discerning collectors G. Webster and B. Melvin. They don’t come much better than this! The price is a bargain for the quality of the Machine. $22,000. The bike has been thru an extensive restoration previous to my ownership. Since I bought it I have driven it some and sorted it well. Its a beautiful show bike that you can ride to the show. I have a Large collection of bikes and have been buying them and selling them for over 50 Years. 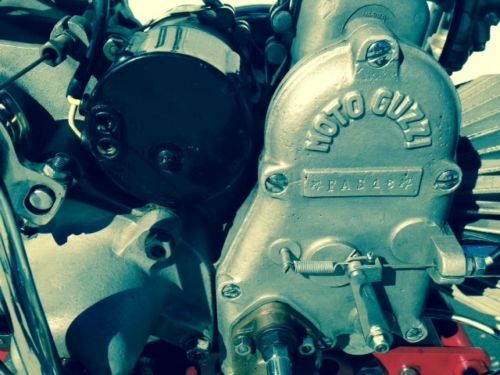 For the last 20 Years I have had an interest in owning a Moto Guzzi Falcone Sport and I have looked at a lot of them, before I found one in this condition. If there are nicer ones, they may not be for sale, because I have seen few nicer than this one. Is it perfect, probably not. Truth is I have never seen or owned that perfect dream bike. There is always something. But I think most of you will find it near that mark. There is nothing significant that I have seen wrong with it. Oh just remembered, one of the tool box covers has a latch that sometimes doesn’t lock well. Needs an adjustment. Oh noes! The tool box cover latch isn’t working all that well! Well forget it, then… With a $22,000 Buy it Now price, the seller is obviously asking premium money for this bike, but you’re unlikely to find an example that both looks this good and runs as well as this one is supposed to run. It’s not clear if this one’s been restored or not but, given the condition, I’ll assume it has at least been repainted. It’s a shame that Guzzi’s current owners over at the Piaggio Group have decided that the big Italian twins will forever fill the retro niche, since Aprilia is clearly intended to be their flagship sporting brand. But that’s a shame, because Moto Guzzi has such a history making sports motorcycles, and that legacy will remain unfulfilled for the foreseeable future.